That the Internet is a great equalizer is a double-edged sword. The upside is that it enables small business owners to compete on a level playing field with large companies in their marketspace. The downside is that clever web-design and viral sharing can result in information of unequal quality being portrayed as having equivalent authority. If you’ve ever suffered the embarrassment of passing along a scam email to a colleague, forwarding an “urban legend” malware warning to your entire Contact list, or re-tweeting a hoax, then you know how important it is to be sure of your facts before passing along that email, tweet, or post. Conversely, you likely understand just how frustrating it is to argue with someone who steadfastly clings to a ridiculous “fact” because they can find “official” content supporting it on the Internet. Facebook IS NOT going to ban posts expressing a religious belief. Google Earth DID NOT capture an SOS from a woman stranded on a deserted island. KFC DID NOT stop using the name “Kentucky Fried Chicken” because they are serving meat from mutant organisms. While examples like the ones above are amusing, mistakenly believing them and passing them on will only make you look foolish, it won’t harm your business (unless you pass them to an important customer or prospect). There are many other online scams that are designed to get you to purchase unnecessary products and services, or worse to compromise your security and steal from your small business. We are a senior domain registrar in Hong Kong, specilized in dealing with relevant infringement and dispute event of domain. On Jan. 16th, 2014, a company named Actor Investment co.,Ltd. applied for registering following domains with us. After checking, we found it conflicted with your name and Trademark, so we would like to confirm with you. Whether you consigned Actor Investment co.,Ltd to register these domains? Or are they your subbranch? You see any potential harm in telling them we have no affiliation with the requestors? Obviously, it opens up a line of communication with someone who we have no idea how legitimate they are, but we aren’t necessarily exposing any information they couldn’t find on their own. Indeed, this email is a variant of a common email scam in which the business targeted is tricked into paying hugely inflated rates to register domain names they don’t want or need. Were we to reply, even if we did not reveal any confidential information, we would have opened up communication lines with scam artists and made ourselves vulnerable targets. How did I know this was a scam? My first hint was that several different people in the company forwarded the same email to me. Second, the email just “felt” wrong—it had a generic greeting, and used poor grammar. To be certain, I searched for it on Hoax-Slayer—a website dedicated to “debunking email hoaxes, thwarting Internet scammers, combating spam, and educating web users about email and Internet security issues.” Sure enough, the scam was documented, and I could safely ignore what ominously purported to be infringement on the PaySimple trademark and brand. So, what should you do when faced with an email that may be important, but may also be a hoax or scam? Don’t react impetuously—take a moment to think things through before responding or forwarding. If it claims to be from African Royalty, go straight to the delete button. To identify less obvious scams, read How to Avoid Spreading Myths and Misinformation Online, a timeless lifehacker.com post, which provides great advice on how to check your facts before you embarrass yourself or put your business at risk. It includes a number of resources you can use (in addition to Hoax-Slayer) to determine whether you are dealing with truth or fiction. Google: Search for the subject of a suspect email, or the headline of a suspect post, along with the word “hoax” or “scam.” In many cases, the result you need will pop right up. Snopes: This site bills itself as “the definitive Internet reference source for urban legends, folklore, myths, rumors, and misinformation.” Anyone can report a rumor, photo, or video and the site will determine veracity. DebunkaDunk: Application Developer Dustin Luck programmed a custom Google Search that queries a large number of debunking sites. It is a great first stop if you see something on the web that doesn’t ring true. 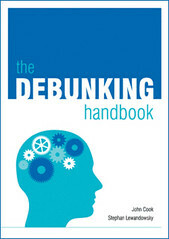 For a more scientific take on the subject, read The Debunking Handbook. This paper by two Australian professors takes an in-depth look at misinformation and how to effectively debunk it without inadvertently reinforcing it instead. Remember: If something sounds too good to be true, it probably is; just because something is on the Internet doesn’t make it true; and a solitary tweet is just as likely to be false as one retweeted millions of times.